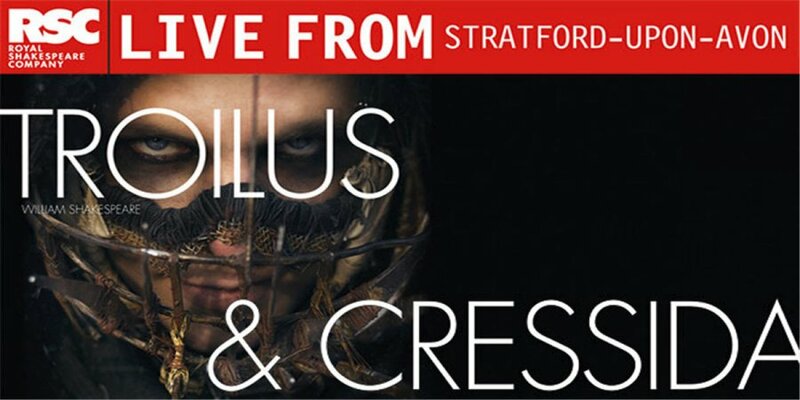 As a regular at Nottingham Broadway’s screenings of the Live from Stratford-upon-Avon broadcasts, it was dispiriting to see an audience barely a third of the usual size at the broadcast of the rarely-staged Troilus and Cressida; doubly so when this was one of the RSC’s most pleasingly innovative productions for some time. Following the Globe’s example with a 50/50 gender split in the cast and a Deaf actor in a prominent role; employing one of the world’s leading percussionists, Evelyn Glennie, as composer; and with a quite stellar, non-celebrity cast of newcomers and RSC stalwarts, there was much to be excited about. Troilus and Cressida won’t be to all tastes, but director Gregory Doran’s choice to go full Mad Max with a post-apocalyptic, motorbike/punk aesthetic, made barmy sense of a generically complex play. Rules and conventions were only as fixed as the strength of any one leader’s dominating presence, and everyone was out for themselves, grouped loosely by tribal affiliations. The pleasing lack of uniformity allowed the company to shine through as individuals in a truly ensemble production. The two titular lovers, Amber James and Gavin Fowler, offered a postmodern cynicism to their roles; James in particular excelling as a Cressida who commented wryly on her own bad decisions with ironic laughs that betrayed a deeper anxiety. Cressida’s raised eyebrows and scornful dismissal of Oliver Ford Davies’s Pandarus were offset by the suddenness with which she grasped for contact, first with Troilus and later with Daniel Burke’s Diomed. I was surprised by how many lines seemed fresh in her reading; a millennial Cressida who set up a defensive shield of humour and barbs, which served her well when forced to kiss a parade of lecherous men, but which left her flailing when faced with sincerity. Fowler, meanwhile, started as a somewhat goofy lover, pratfalling in nervousness around Cressida and swaggering in a performance of masculinity. He was at his sweetest in the standout getting together sequence, when the two sparked off one another and he finally relaxed in the warmth of her admission of love for him, showing tenderness and a bit of confidence; when she was moved to the Greek camp, however, his downturn into bitterness carried a real edge, with the entitlement of the incel and a self-righteous sneer that, while unpleasant, still carried the genuine hurt. The two were compelling leads in the bitter love story. But Troilus and Cressida isn’t really their play, and the strengths of the rest of the ensemble were myriad. At the more established end, Ford Davies was a perfect Pandarus: embarrassing and extremely creepy as he urged Troilus and Cressida to kiss; winsomely dithering when confronted by the wit of the younger people; and with an energetic, camp presence that allowed him to convincingly manipulate events even as everyone mocked him. He was countered by the fantastic 80-year-old Sheila Reid as Thersites. Diminutive, spry, and utterly irrepressible, Thersites took every liberty with the beautiful young men (especially Theo Ogundipe’s Ajax and Andy Apollo’s Achilles) who towered over her, rubbing her crotch gleefully and offering withering putdowns to James Cooney’s Patroclus. Thersites’ unusual physicality and clearly marked otherness were part of a grotesqueness that allowed her to undermine everyone around her, and her joy in others’ misery and descent to her level gave her an impish, almost Mephistophelian quality. The cynicism extended throughout the other performances. Some offered flat-out comedy – Andrew Langtree’s Menelaus was a bit of a disappointment here as a barely articulate lunk – while others offered a more nuanced take on their roles. The strength of the actors in relatively small roles was a huge advantage here: Amanda Harris, for instance, made Aeneas almost a leading role as she strode between the two camps, manipulated the Greeks and supported the Trojans, traded icy words with Diomed and mourned Hector. Her grandstanding announcement of Hector’s challenge was matched by Suzanne Bertish’s scenery-chewing Agamemnon, with shock of white hair and a roaring style of command. But the combination of grandstanding and bleak humour was most fully realised in Adjoa Andoh’s Ulysses. Andoh milked Ulysses’ mimicry of Achilles and Patroclus, her Machiavellian double-dealing, her behind-hand mockery of her peers, for all they were worth, to all intents and purposes a better-spoken Thersites. Her outburst of anger against Cressida after being refused a kiss suggested something of what lay beneath the scheming; and, in a shocking moment, Ulysses herself shot Patroclus in a genuinely surprised bit of realpolitik to get Achilles into the fight. One of the most cynical operators in this already cynical world, Ulysses was terrifying. Yet these elements of the production didn’t take away from the more serious emotion. The choice to cast Charlotte Arrowsmith as Cassandra was a fascinating one, turning the refusal to believe Cassandra into a more striking issue of failure to communicate as the actor signed, gestured and wailed frantically and movingly, and her brothers refused to listen. Troilus in particular became abhorrent in these scenes in his dismissal of his Deaf sister as mad, and the sight of Hector restraining Cassandra, putting his hand over her mouth to stifle her wails and dragging her away, was hard to watch. Daniel Hawksford was excellent as Hector, too; clearly hard as nails, his ready smile and refusal to back down from a confrontation made him both a charismatic and a fearful opponent. Throughout the post-apocalyptic landscape, in which the Greeks lived in shipping containers and the Trojans looked down from steel gantries, characters created their own spaces. Daisy Badger’s Helen spoke the Prologue from a nest-like boudoir that descended from the ceiling, and she and Geoffrey Lumb’s Paris were later contained within it for their meeting with Pandarus. Achilles and Patroclus, meanwhile, explicitly in a relationship here, shared a container with a bead curtain, from which they emerged with trousers unbuckled in their first appearance. The golden-haired Achilles’ gradual emergence from his container over the course of the play to re-engage with the world was simultaneously comic and tragic; his arrogance and self-possession were continually deflated by Thersites and the other Greeks, and yet his sincere love for Patroclus and his quietly heroic expression prevented him from becoming ridiculous. And this is where Robin Lough’s direction of the screen version especially helped, in one of the most dynamic and sensitive capturings of an RSC production I’ve yet seen. With liberal use of wide shots to capture the whole ensemble against the bronze floor and facade, there was a fine sense of the scale of the production; yet intercut with close-ups that made sense of the complex story and allowed each of the cast a chance to shine. For the comedy, Thersites and Pandarus were given a great deal of close attention that got the most from their subtle tics and shrugs; and the reaction shots throughout were also well chosen. Yet as the play moved into its deaths, the camera switched to capturing the drama; while the immediate effect of Ulysses’ shot was a little unclear (we could have done with seeing Patroclus go down more quickly), Lough set up some outstanding cuts to straight-on images of Achilles emerging carrying Patroclus’ body, silhouetted against blinding light; and then, as the Myrmidons closed in on Hector, a wonderful image of his body, impaled vertically, reaching up in pain while the distant Achilles looked on. The epic quality of these shots worked beautifully with the company to render these moments truly significant, foregrounding Achilles’ treachery and the pity of Hector’s death. The epic quality was furthered by the stunning percussion score, performed by four outstanding musicians who, pleasingly, were given an unusual amount of camera time, acknowledging their relatively visibility in the circle level. Oscillating between thunderous drumming and melodic chimes, the music resonated with Niki Turner’s metallic set, seeming to bring the sounds of it to life in a way that evoked Michael Boyd’s Histories Cycle. And Terry King’s fight direction was some of the best I’ve seen in years, with fast and furious duels between Hector and Ajax, and Troilus, Diomed and Ajax, swords flailing and actors jumping with a speed and confidence rare in live theatre. I’m surprised as I write to find myself feeling so positive about the production, and concentrating on the very fine elements perhaps occludes my sense that the production was, despite everything, a little dull and far too long; many of the scenes stretched on interminably, and while the post-apocalyptic conceit allowed for a great deal of visual and aural variety, the production also lacked a strong interpretive hook to bring all the disparate choices together. It’s a tricky play, and despite the hard work of both cast and creative team, the good individual parts added up to a bit of a mess, even if a hot one. But the ensemble ethos, the attention to even small roles, the overt effort to consider diversity in casting, and the high quality music and movement work all pointed to an RSC that is, hopefully, getting better at identifying its core strengths. Hi Peter, I’m so glad you share my enthusiasm for this terrific production. I saw it in Stratford on Halloween night and attendance was miserably thin. Although I was rather hoping that this was because everyone was out trick-or-treating, it sounds like this is not the case, and the production is struggling to find its audience. How sad. Having left the dire (and appallingly well-attended) Christopher Ecclestone ‘Macbeth’ at the interval (you didn’t give that production a positive review and you were still too kind), I wasn’t holding out much hope for the RSC ‘Troilus & Cressida’; but I’m happy to say I’ve never seen a Shakespeare play come to life so thrillingly. I saw Adjoa Andoh underused as Casca in ‘Julius Caesar’ recently, and I’m glad to say I’ve now seen her give a first-class performance, which was not only greatly entertaining but deepened my understanding of Shakespeare’s inscrutable reading of Ulysses. I also concur that Charlotte Arrowsmith’s Cassandra was a highlight. The sense of marginalisation and general unfairness that defines the character was greatly increased by the presence of the deaf actress. I found the dramatic effect quite moving, which is not what I would have expected from a performance of (what I consider) Shakespeare’s most pessimistic play. Anyway, thanks for the fine review Peter, look forward to reading more! Julius Caesar! That’s where I’ve seen Andoh before – thank you!